When you pass by a local graveyard, you must be thinking how haunted these places must really be. Well, maybe you don’t think that specificaly, but I myself have thought that on many occassions. Having done a few EVP capture sessions at two of our local graveyards and having captured five good, clear EVPs, it’s very clear that graveyards have a fair amount of activity. Graveyards are one good place for certain investigations, but hospitals, given the fact that many people do and have passed away at these places, most certainly are hot spots for paranormal activity. After all, if you had suddenly passed away at a hospital, it would be a traumatic passing for you…not wanting to have died there, but you had no choice and did anyways. Those traumatic moments would certainly lead to a residual haunting in some cases and in most, an ongoing one. The video below is a very good example. It’s an investigation done by the Oklahoma City Ghost Club at the Old Woodward Hospital. I think you’ll enjoy this as much as I did. And will the rest of the world follow? Will the rest of the world follow suite and stop all of this decades old cloak and dagger act, and just admit that, yes world…we are not alone! In an unprecedented exclusive interview with A. J. Gevaerd, editor of the Brazilian UFO Magazine, one the highest ranking and most distinguished officials of the Brazilian Air Force, Brigadier José Carlos Pereira, recognized that “it is time to end the UFO secrecy“. You can read the whole story by clicking here. But essentially, isn’t it about time that the worlds governemts just step forwards and admit that the human race is not the only sentiant race this side of the universe? I truly do think the time is now for our worlds leaders to step forwards with the whole truth of this matter. Religious differances aside, I’m thinking we as a human race can cope with the actual truth. A subject that might possibly be amongst the most mysterious and most debatable…the crystal skulls. These skulls have launched a lifetime of fascination, debate, scrutinization and even a very cool movie recently released. Of course there’s also been numerous documentarys as well as other not so well done movies from past years. Since the first debatable discovery of the crystal skull found by British explorer F. A. Mitchell-Hedges, who claimed that his daughter unearthed it in 1924. Mitchell-Hedges led an expedition in the ancient Mayan ruins of Lubaantun, in Belize. Of course it was released later on that the discovery and the details were fabricated. Even though, the entire mythos behind these skulls are very interesting! There are 13 skulls that are rumored and believed to have been created by extraterrestrials or beings in Atlantis or Lemuria. One elaborate theory maintains that the skulls were left behind by a sophisticated Inner Earth society which lives at the hollow center of our planet, and there are thirteen “master skulls” which contain the history of these people. Now while I personaly do not believe that these skulls were created by ET’s, or some advanced race from beyond the stars, I do believe however, that these skulls were created by a once proud people called the Aztecs simply because they were very adept at working with crystal. And also given the fact that the Aztecs were a very religious people of whom took their religion very seriously to the point where the Aztecs would most assuradly have passed the skull crafting down through the generations and so on to keep their traditions very much alive for future generation of worship and devotions. More than five years ago this subject was being talked about on a fairly normal basis…globsters. 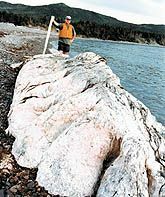 These giant lumps of fatty, hairy things were seen washing up on shores from Tasmania to New Zealand and other points around the planet. Now a days though, there’s no mention of these globsters in the news. If there have been any new sightings or findings, it’s not being reported, or it’s just not being taken seriously any longer. The carcass measured 20 feet long, 18 feet wide and 4 feet thick at one end, tapering to just 6 inches at the other. The material was hard and rubbery and covered with fine hairs, “almost like sheep’s wool with a greasy feel”. Five or six gill- like hairless slits were on each side of the high end (front?) where there were four large, hanging lobes, two to a side of a smooth, gullet-like orifice. Even after being informed of the discovery the scientific community showed little interest for almost two years until the Tasmanian Museum undertook an expedition to the remote location. When they arrived they found the lump in the same place with “no smell, no sign of decomposition, and the skin was as hard as ever.” The creature, lump … thing was examined, photographed and pieces were cut off and carried back for analysis. Now the find was a world sensation. Dubbed a Globster in the press, theories ran wild about its origin and classification. Everything from a giant ray to a creature from outer space were suggested and discussed as two years passed. Finally the Australian government made the announcement that the mass of material, unlike anything ever seen before, was nothing more than a whale carcass. A hairy whale with gill slits and which didn’t decompose after two years. 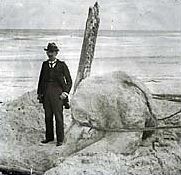 In 1896, an 18-foot long, pink, fibrous mound was found partially buried on a beach near St. Augustine. Speculations as to the lump’s origin lead to pieces being cut off and sent to various scientists and museums around the country, including the Smithsonian, then called the U.S. National Museum. Locals, and at least some members of the scientific community, declared the lump the remains of a giant octopus. Impossible, declared the majority of the scientist of the day. The argument raged long after the Blob had disappeared, probably washed back out to sea. Eventually the argument faded along with the memory. Even though there does not appear to be any new findings of these globsters, and given the supposed facts that these things were nothing more than whale blubber, the fantastical idea that these globsters might have been some kind of unknown sea going monsters still spark the imagination and give a faint glimmer of hope to cryptozoologists that there may still be an undiscovered species of giants lurking beneath the waves of our immense ocean. Sightings of the Mothman creature itself by more than than 100 witnesses – a tall, headless beast with glowing red eyes and huge bat-like wings. Men-in-black appearances. Arriving black cars, these weird men mumble codes and bits of strange languages. They try to drink jelly and have difficulty using knives and forks. Electrical disturbances to such devices as TVs, telephones and a police radio. Eerie predictions and spontaneous prophecies, some of which were oddly out of sync. Strange coincidences and repeating numbers. A missing, possibly dead dog. The dragonfly drones – What are these really? I’m officially admitting it…I’m becoming infatuated with a story (this story is now more than 1-2 years old now) that at first I dismissed it as nothing more than a series of really good fakes concocted to get somebody a lot of attention. Yes, there have been one or two fakes of this “Drone” story. If WordPress will allow me, I’ll post two pics of the drone that had garnered the most attention. If, and only if these are truly alien drones or perhaps interdimensional type drones, what are their true purposes here? Are we as a species being observed and scrutinized to see if we are worthy of direct contact? Or maybe are these drones studying us or the environment simply because that whoever is on the observing end are preparing for invasion, or just perhaps integration into our society? June 29, 2007 Montgomery, Alabama – This week on Tuesday, June 26th, the mystery of the dragonfly-shaped aerial drones took another turn with the release of an alleged secret report containing photographs of alleged extraterrestrial technologies, entitled “Commercial Applications Research for Extraterrestrial Technology (CARET), the Q4-86 Research Report”, dated December 1986, Palo Alto, California, by the Palo Alto CARET Laboratory, also known as PACL (pronounced ‘packel’). The CARET Laboratory’s research goal is stated as, achieving a greater understanding of extraterrestrial technology within the context of commercial applications and civilian use. I just updated the Featured Videos page with new videos. Be sure to watch the Japanese creatures segment. There’s some really amazing sea creatures caught on video that were found at some deep depths in that region of the world. Want to contribute to this blog and be a writer for The Paranormal Effect, for a new section that’s soon to come? If so, just drop me an email to mjgcny@theparanormaleffect.wordpress.com and I’ll get back in touch with you within a day or two max with details and so on about being set up as an exclusive contributor to this blog. The new section I just mentioned will be found at the top in the same area as the featured videos etc., section. Hope to hear from you soon. Enjoy! Are Angels ambassadors from a Supreme Being? There are many different variations on where the first angel made its appearance. Most religions have some type of winged or flying human. But I always thought true angels would have that certain presence about them that would make you know they was not just a winged flying human. These three of the major western religions, Christianity, Judaism, and Islam believe that angels are the intervening force between us and a Supreme Being. In Buddhism and Hinduism angels are also big players. Angels are mentioned in the bible as early as Genesis as the “Shining Ones” . Christian art begins depicting them somewhere between 306-337 A.D., and some of the other religions have had them since before the 14th century. Possibly the best known angel is the fallen angel named Satan, Beelzebub, Lucifer, you know the “old Devil himself”. Even most atheists would recognize the name of that angel. Thru history many angels have made their appearance but some of them are more well known than others. There is the Angel that appeared for the birth of Jesus, the Angel Of Presence, heck there was even an Angel reportedly seen at Valley Forge by General George Washington. Then there is the Seven Archangels: Michael the warrior, Gabriel our messenger to God, Uriel the angel of death or transformation, and Raphael does healing, these are the four most common of the seven. So, are Angels ambassadors from a Supreme Being? Angels are supposed to guide us, protect us, heal us, and bring us messages from heaven. There are angels to do just about anything you need help in doing. According to history there will always be an angel around so we are never truly alone in this world. Angels have gained in popularity that has not been seen since around 1900’s, and its no wonder. Time magazine reports 69% of Americans believe they exist. In our chaos filled world doesn’t the idea of angels amongst us, help fill us with just a little bit of peace. It helps re-affirm that even as busy as god must be, we are not alone. Flying saucers…not anymore. A flying cube! A few days out of date for sure, but very interesting though. The “explosion” of UFO sightings in the U.K. are nothing new. But perhaps you missed this short write up of something refreshingly different…flying cubes! The original write up of this story can be found at the telegraph.co.uk website. We have had saucers, triangles, orb style and now cubes. I wonder what will be next? While Madden saw a conventional disc-shaped UFO, Cockcroft reports that on June 7, three OTHER military men saw UFOs which looked like “rotating cubes,” while they were on foot patrol at night near a military barracks. Now that a mountain of paperwork has been done and a nightmare is coming to an end, be looking for normal posting to resume. I’ve got a few interesting topics I want to hit on very soon. And not to mention a few new additions video wise I want to add in dureing the course of the day.